At nearly six metres (20ft.) 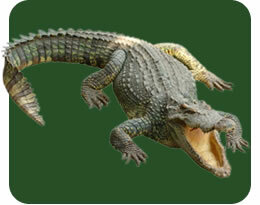 in length and weighing up to 730kg (1650lb), Nile crocs are among the largest of all crocodiles. Although fearsome predators, they are caring parents and guard their nest of eggs for months, digging them up when the babies ‘chirp’ and helping them hatch. Females carry the babies by mouth to water and stay with them for two months. Unable to control body temperatures internally, crocodiles bask in the sun to warm up and slide into water to cool off, opening their mouths to release heat.